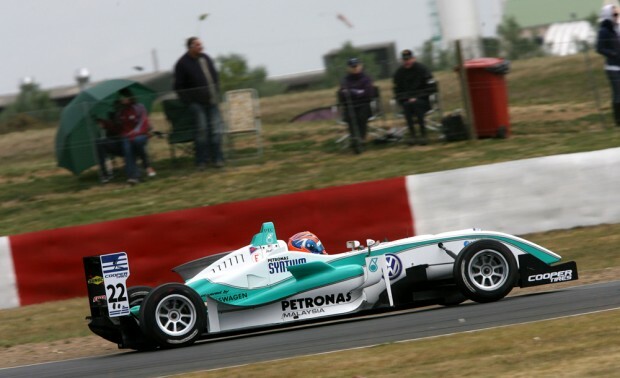 Leading young Malaysian driver, Jazeman Jaafar, finished on a fourth place high after enduring a tough start at the third round of the Cooper Tires British F3 International Series held at Snetterton circuit, Norfolk this weekend. The race weekend began with two practice sessions, but a gearbox problem for Jaafar after a couple of laps sidelined him for the remainder of the session while the Carlin mechanics worked to resolve the issues. Jaafar was able to be back on track for the second practice session and working hard to catch up as much as possible, having lost valuable track time. In the qualifying session, PETRONAS-backed Jaafar showed his promising talent, bouncing back from the early weekend woes to post sixth and seventh best qualifying lap times to line up seventh on the grid for the first race and sixth place for the third race. The first race proved frustrating for Jaafar, with a suspected overheating clutch and an engine misfire compromising the young racer. He persevered with an underperforming car, finally finishing 16th. From this start position for the second race it was always going to be tough for Jaafar to make up ground, but it was an opening lap accident ahead of Jaafar which put paid to any chances of a points finish. A start line tangle for a pair of mid-grid cars left the 18-year-old Malaysian with nowhere to go and an unavoidable clash with Menasheh Idafar left him with a damaged front wing. Pitting for a replacement put him a lap down, but Jaafar was out to show his pace and put in a series of blistering laps, with second quickest lap of the race. The third race, with Jaafar starting sixth, was his final opportunity to salvage some points from the weekend. At the start Jaafar was up to fifth place, and by the end of the race he was in fourth position, charging hard to overtake third placed man, Riki Christodoulou, finally finishing just two-tenths of a second behind him, narrowly missing out on a podium place. The Malaysian now turns his attentions to the second round of the FIA Formula 3 International Trophy, heading to Pau, France next week for this classic street circuit event.